Today I'm continuing my latest trend in Cars posts with Costanzo Della Corsa! As seen in the screen shot above, Costanzo is one of the hot shot cars that pulls into Luigi's and Guido's tire shop with the Ferrari near the end of the original film. This is a new (well, again, technically a re-release) 1:55 scale diecast from Mattel, just recently available again as a Toys R Us exclusive. 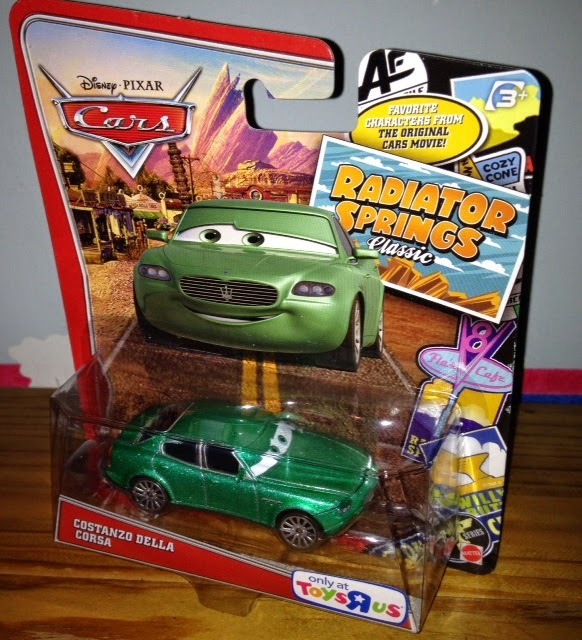 This release is part of the "Radiator Springs Classic" series and is the first time this character has been released in years. I was happy to find him just two days ago, since I had missed him when he was initially released a few years back. Costanzo was originally released as part of the "Final Lap" collection (I believe in 2009 or 2010, image seen HERE) and then as part of a "lenticular eyes" 3-pack with the Ferrari F430 and Antonio Veloce Eccellente (seen HERE).